MARBLE FALLS — Kay Baker was so happy with the outpouring of donations during the KBEY 103.9 FM Radio Picayune and The Picayune Toy Drive on Dec. 6, she could have danced a little jig. The 2017 toy drive, benefiting Highland Lakes Christmas is for Kids, Burnet County Santa’s Helpers, and Granite Shoals Christmas Outreach, drew hundreds of people to the three drop-off locations. The donations included toys and money. In Burnet, folks dropped off boxes and boxes of toys and gifts while also donating $1,540.33 that will go to Burnet County Santa’s Helpers. 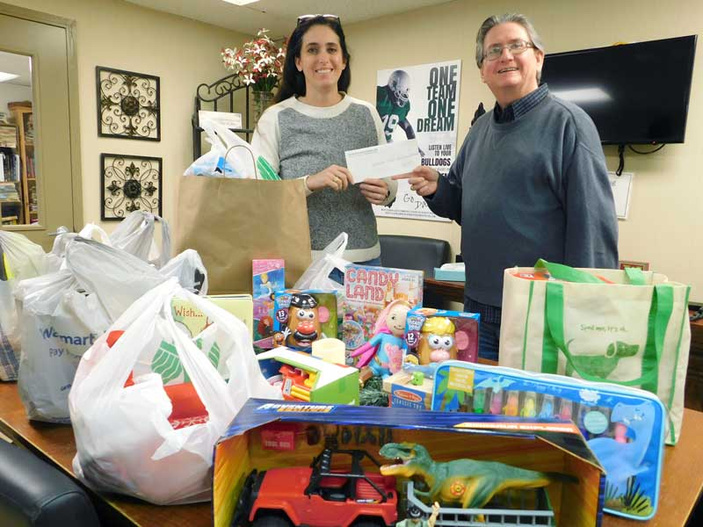 This was the first year for a Granite Shoals drop-off site, and people there stepped up with plenty of toys and gifts as well as an additional $488.33, which will go to Granite Shoals Christmas Outreach. Baker and her KBEY “Wake-Up Call” co-host Ed Chandler were at Chevy-Buick of Marble Falls and enjoyed a big turnout along with several special guests. The toys and gifts piled up, and donors also contributed $3,513.33 for Highland Lakes Christmas is for Kids. Then she danced a little jig. If you still want to help these great causes, you can purchase a copy of the “KBEY & Friends Christmas” CD featuring local musicians and entertainers singing some of the Christmas classics and a few originals. Go to KBEYFM.com to purchase a CD, which is $10 plus tax and shipping. You can also purchase them at The Picayune and KBEY office, 1007 Ave. K in Marble Falls; Numinous Coffee Roasters, 715 RR 1431 East in Marble Falls; Ford and Crew Home and Hardware, 1400 Ninth St. in Marble Falls; and Unshakable Grounds Coffee Shop, 134 Main St. in Burnet. If you still would like to contribute to the Toy Drive, you can drop off donations at The Picayune and KBEY office, 1007 Ave. K in Marble Falls, during business hours. We'll make sure your contribution get to one of the organizations. You can also purchase one of the "KBEY & Friends Christmas" CDs, which are available at the same address.